Celebrating 50 years in naval architecture, ICE, Europe’s largest independent marine designer, will be showcasing its proprietary design capability at the 14th Asia Pacific Marine Show in Singapore during March 16-18, on stand E-L5. 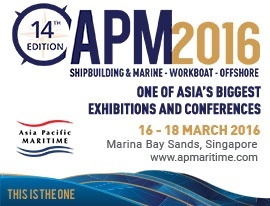 This will be the fourth time ICE is exhibiting at this major event, which will see the company featuring its generic marine designs for several Floating Production Storage and Offloading (FPSO) hulls and for a self-propelled jack-up liftboat. With a service life of 25 years or more without dry-docking and providing accommodation for 110-160 people, one of the FPSO designs shown is adaptable to topside configurations weighing up to 30,000 tons and a production rate of up to 150,000 barrels of oil per day. Having been granted DNV approval in principle, the design is capable of storing 1.6 million barrels of oil available for discharge, with an offloading capacity of one million barrels of oil per day. A design with an even larger capacity is currently being developed. Steinar Draegebo, Chairman of the ICE group of companies, commented: “Our focus over the last ten years has been the marine design of Floating Production Storage and Offloading (FPSO) vessels, involving more than 40 such projects ranging from new construction and conversions to various technical studies. On the stand ICE is also showing a robust self-propelled jack-up liftboat that provides a low-cost flexible platform for maintenance, wind turbine installation and other offshore jobs.